Among the many interesting architectural aspects of Solapur, what attracts the visitor to the city more is the temple of Shri Siddheshwar in the lake with a garden and coconut trees and a fort at the west presenting a picturesque background. The Siddheshwar lake occupies an area of five acres and is about 20 feet deep. It is surrounded by a narrow path. To make an approach to the water of the lake easier, ghats or flights of steps have been constructed. The most well-known ghats are Hatti, Pakhali and Dhobi. 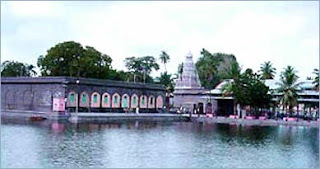 The temple which is surrounded by the lake waters has two parts. One at the west, viz., the courtyard contains garden, shrines of devotees, and the samadhi of the saint Shri Siddheshwar with a cloister and the other, at the east, comprises the shrine of the saint, an antechamber, a sabhamandap, etc., without a cloister. The courtyard which has a cloister is encircled by a road about 18 feet to 20 feet broad. The road is however cut off for a short distance at the north. The inner side of the road touches the backwall of the cloister while the outer side of the road has a continuous flight of steps leading down to the water of the lake. Three gates are provided in the cloister for reaching the inner side of the courtyard from the road. The main gate faces the west and has a stone platform towards its west known as Amritling ghat. The stone platform admeasures 20' X 20' and is surrounded by lake water at its north, south and west. It contains two square stone altars each, one having two lingas without a shrine and another containing four lingas without a shrine and at the centre, there is the shrine of Amritlinga. The other gate of the cloister is called dakshin darwaja. To the south of this gate there is an island semi-circular in shape. The third gate of the cloister called uttar darwaja opens into a well. The cloister is constructed in stone and lime and is said to have been built during 1836 to 1917 A.D. by many devotees. The courtyard is divided by a narrow path which leads from the main gate of the cloister to the temple of saint Shri Siddheshwar. The southern part has no garden but has a linga on an altar without a shrine near the cloister. Just near this linga there is a shrine with plain stones containing the samadhi of Billesh Bammayya. In the centre of this portion of the courtyard and near the path there is a samadhi of Shri Siddheshwar. This is the place where the great saint immolated himself. This samadhi is at the south-east of the temple and is fenced by wire and bushes. A quadrangular stone platform admeasuring 15' X 15' is constructed 3 feet above the ground. Another stone platform of 12' X 12' X 2' is constructed on this platform. On the surface of this platform there is a raised platform containing two lingas called " Yoginath". The raised platform admeasures 8' X 8' X 4'. Arrangement is made for pouring water continuously on the lingas from a pot kept hanging from an iron bar. The other part of the courtyard has a well-planned garden with alleys. In the centre of the garden there is a shrine of saint Nalavatvad. To the south-east of this shrine near the cloister, there is the shrine of god Vithoba and goddess Rukhmini. The main temple which faces the east can be approached by a path from the western gate of the cloister or by this road around the cloister. The main temple comprises a sabhagriha, the pharashi mandap, the ante-chamber and the shrine. The sabhagriha is surrounded on three sides, viz., the south, east and north by a path 10 feet wide. This path is fenced with iron bars about ten feet high with iron arches with arrangements for decorations with lights and lamps. Four steps from the path lead down to the holy water of the lake. The sabhagriha is divided into equal parts with four east-west rows each having nine iron pillars. The hall admeasures 80' X 100' X 25' and is floored with plain stones. The hall without walls is shaded with conical tin sheds resting on horizontal iron plates fixed on pillars. The pharashi mandap, a hall admeasuring 30' X 20' X 25' is built by the devotees during 1900 to 1910. A brass-plated wooden beam separates the pharashi mandap and the ante-chamber. The lower portion of the beam is occupied by brass latticed plates with brass bars. The ante-chamber is known as nandicha gabhara and in it stands the silver-plated image of the sacred bull, the favourite conveyance of god Mahadeo, facing the west. The back wall of the ante-chamber has only one gate which opens into the shrine. The shrine has an area of 15' X 15' with a stone roof in cut corner style. The entire construction is of stone. In the centre of the back wall there is a niche. It is the place where the saint Siddheshwar used to meditate. The entire niche is plated with silver as is the seat or sinhasan of the deity. On both the sides of the niche there are pillars plated with silver and a spiked arch rests on the pillars. The upper portion of the pillars and the arch are decorated with leaves and the entire decoration is plated with silver. The back portion of the niche has silver plating with floral designs. A five-headed cobra made of silver is in the centre. On the shrine is a spire. It has four tiers with niches having images of gods and goddesses. It has also a dome surmounted by a gold-plated pinnacle. It is said that the shrine was built 600 to 700 years back by the Habbus who were disciples of saint Siddheshwar. The objects of worship in the shrine are the gadi of the saint and the saint's mask mounted on it in the niche in the back wall. The niche which is 3 feet above ground is converted into a sinhasan by two pillars on either side with an arch resting on them. In the centre of the niche there is a square platform made of black stone admeasuring 1' X 1' X 4½' to hold the mask with an image of five-hooded cobra with silver cover. This platform is called the gadi or the seat of the saint. The silver cover on the gadi has a silver cylinder fixed in its centre to hold the mask with an image of five-hooded cobra of silver shading it. Both the mask and the cobra image are gold-plated. A gold-coated silver crown with a diamond in the centre and fish-shaped ear-rings on either side is put on the head of the mask. The deity is worshipped thrice a day at about 8-00 a.m., 4-00 p.m. and 8-00 p.m. The gadi is worshipped after removing the silver cover. It is cleaned with water. Five nectars are then poured on it to the accompaniment of mantras or holy verses. The gadi is then rubbed with lemon and sugar. It is then cleaned with water and scented oil, and argaja is applied to it. It is then washed with hot water. A sandalwood paste is then applied to the gadi and offering of flowers and bel leaves are made to it. Incense sticks are waved and cooked meals are offered. The last item of the puja is waving of lights. The puja is performed by the priests who are Habbus. The abhishek or the pouring of five nectars is performed during the morning and evening pujas. Naivedya is offered thrice a day. During the fair and on every Monday in the month of Shravana, the afternoon puja is not performed. After the puja is over the mask and the cobra are put on the cover. Sandalwood paste and vibhuti are applied to the mask and flowers and garlands are offered. Silver foot-prints are kept in front of the mask and a gold-coated silver umbrella is put on the heads of the cobra. Extremely valuable mukut or crown with diamonds adorns the divine head of the mask on festival occasions. A necklace of rudraksha beads partly covered with gold and with golden chain is put on ceremonial days. On every Monday, the favourite day of the saint, the deity is worshipped thrice a day with shodashopachar worship. Before the worship of the deity, the samadhi in the courtyard is worshipped. This worship includes pouring of water (abhishek), offering of bel leaves, chanting of mantras for 108 times, offering of food and waving of camphor arati. The priests of the deity belong to the Veershaiv Lingayat caste. There are eight households of these priests which change their turn on every Tuesday after the morning puja. It is believed that the inhabitants of this city became prosperous since the birth of the saint Siddheshwar. It is also said that the deity is capable of bestowing blessings on the devotees. The pilgrims, therefore, make promises for getting a child or removal of body pain, gaining prosperity in business, etc. On the fulfilment of their vows they offer pujas, etc. For getting a child they make a vow to remove the first hair of the child in the premises of the temple. Some pilgrims cover the distance between their houses and the temple by falling prostrate on the ground. Some pilgrims offer a pan-puja wherein the deity is decorated with betel leaves. Some offer garlands of dried coconuts or flowers. Another offering is of seven cereals. The mixture of seven cereals measuring eleven seers is kept on the gadi in the shape of a linga. A bunch of flowers or copra or lemon is offered to the mask. Some pilgrims perform the worship with the rudra, laghu rudra, maha rudra, etc. The fair is celebrated from 12th to 16th January. The principal day of the fair is 14th January on which day the saint had allowed one of his female devotees to marry his mace (yogdand). One Ganga-bai of Kumbhar caste desired to marry the saint who would not allow it. He, however, allowed her to marry his yogdand (mace), which she did and committed suicide afterwards by burning herself. The fair commemorates the marriage ceremony and devotion of the girl. Due to great attraction of the fair and the faith in the deity, people from far and near flock to the place. Nearly one and a half lakh of people visit the place during the fair. The largest number of pilgrims, i.e., about fifty thousand, attend on 14th January. Lodging arrangement of the pilgrims is made in the arcade surrounding the courtyard. The pilgrims also use the cloister for lodging purposes. The city has many lodging and boarding houses and dharmashalas. Unlike many holy places, there are no professional upadhyayas or pandyas or hosts to make arrangements for the pilgrims. Some pujaris, however, make arrangements for accommodation of the pilgrims who come from Bijapur, Hubli, Dharwar, Bangalore, Mysore and also from the district itself. Large number of pilgrims come from southern India. Besides the pilgrims of Lingayat caste, the fair is also attended by pilgrims belonging to other castes amongst Hindus.